Fly from Chicago on your dynamic, 7-day adventure, customized for 27-32 year olds from Chicago! Don't miss out on this opportunity to travel with Israelis your age for the whole time & people from the Chicago area. 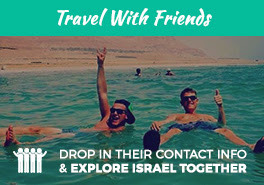 Now is your time to experience the sites, vibes, flavors, culture, history, & so much more of Israel! "Over the last week in Israel, I had one of the most meaningful, & fun trips of my life. As soon as I arrived, any preconceived ideas of what I would see & hear were immediately challenged & the experience far exceeded any expectations I had going in about what I would find. The group of people I shared this journey with could not have been better nor more fun to be around. Israel is a complex yet inviting place full of a diverse set of ideas, opinions, & people & I would recommend everyone go see it for themselves."